The need is great in rural Kenya. In the area we are in, there is only 1 US trained doctor for a catchment area of over 1 million people, the local doctors only receive on average 4 years of training post high school and the access to medical literature is in limited supply. Although we recognize that our contribution will be small, we hope to add 1 doctor, 2 specialties, 2 additional years of residency training for local doctors and support continued education. Most importantly, we hope to show individuals in this community the love of Christ. 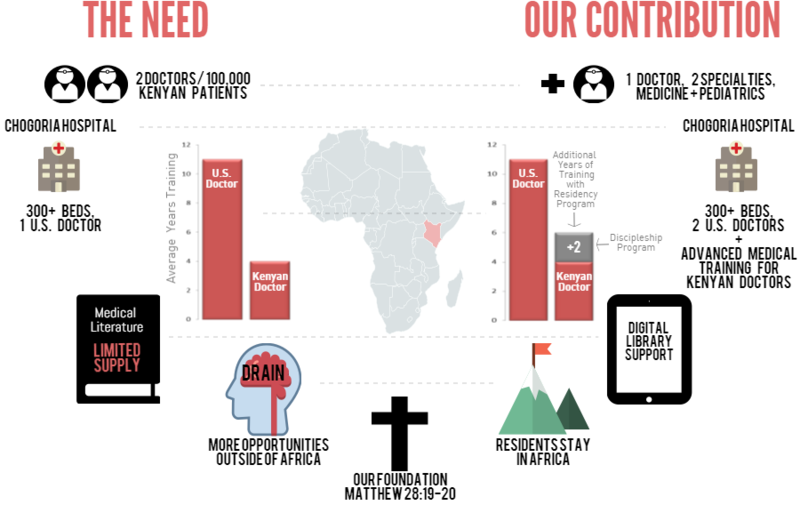 Mouse over the infographic below to learn more about the need and our contribution. On Jason’s last trip to rural Kenya, he helped care for a young girl who was hit by a car. Unfortunately, traumas, like this one, are a common occurrence. The little girl suffered a mild traumatic brain injury and some internal bleeding. She was taken to the operating room, and as the only pediatrician there, Jason cared for her after surgery. Thankfully, and by the grace of God, she made a full recovery. This is the hospital where Jason will be providing patient care and teaching. This little girl’s story is representative of the ongoing changes in itinerary for this community. The surgeon on staff in the hospital was trained in another area of Kenya by PAACS (Pan African Academy of Christian Surgeons). This program trains African doctors in general surgery, provides gospel-centered discipleship and requires them to stay on the continent to practice. Amazing, right? We will be mirroring this exact approach with our family medicine residency program - we will provide additional training, discipleship and ask the newly trained doctors to stay within Africa to practice. Additionally, the current absence of pediatrics in the hospital to care for kids, like this little girl, is a serious constraint for the community. As you probably know, caring for kids is often very different than caring for adults - from diagnoses to treatment. Thus, we are thrilled to further equip the current doctors and residents to not only provide increased care for adults, but also sick kids. Most importantly, we will be sharing His love with those who are sick and hurting, and discipling the next generation of African doctors to do the same. Our desire is to see our personal change in itinerary change this community's itinerary.